Town of central Hungary. Jews are mentioned there as tax-farmers during the Turkish rule in Hungary (1552). When the Turks were driven out of that country the Jews of Szegedin had to leave; subsequently, in 1714, three Jews, who had settled there without the permission of the magistrate, were expelled, and at the conscription of 1768 the authorities claimed that not one Jew was living in the town. In 1719 Charles III. granted to Szegedin the privilege, enjoyed by most of the free royal cities, of admitting Jews and Gipsies, or refusing to admit them, at its pleasure; and Szegedin, like the other cities, exercised this privilege with the utmost rigor to the disadvantage of the Jews. In 1781 Michael Ḥayyim Pollak settled in the city without permissionof the magistrate, but three years later six families obtained such permission. After this the number of tolerated Jews gradually increased; there were 11 families in the town in 1785, 18 in 1786, and 58 in 1799. In virtue of the decree of 1790 the Jews were to remain unmolested in whatever circumstances they were at the time of the decree. This encouraged them to acquire houses within the limits of the city; and whereas in 1788 only the above-mentioned Pollak possessed a house, in 1807 ten Jews were house-owners. In 1813 a boundary-line was drawn within which Jews were permitted to acquire houses, but as early as 1824 the Jews encroached on ground beyond this boundary, though the ordinance was not repealed until 1859. In 1825 the community had increased to 111, in 1831 to 367, and in 1840 to 800. 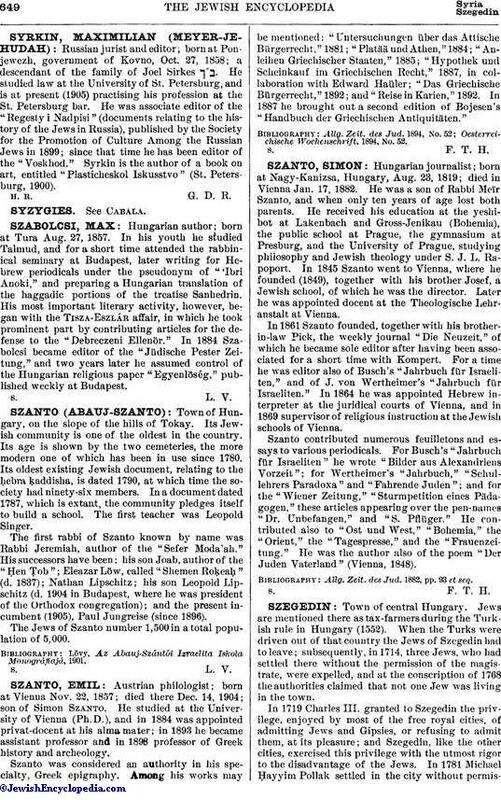 In 1884 there were 800 Jewish taxpayers in Szegedin. The first communal statutes, referring especially to worship, were drafted in 1791, and included nineteen sections; they were enlarged in 1801 and revised in 1830. Until 1867 a commissioner delegated by the municipal authorities presided at the election of the governing board. In 1825 it was decided to elect a committee of thirty-one members, whose rights and duties were determined in 1830 and revised in 1833. After a futile attempt to reorganize the community in 1842, a marked advance was achieved in 1857, when the magistrate undertook the work of organization. In 1863 Leopold Löw, the chief rabbi, drafted statutes that are still the basis of government. These statutes were modified in 1867 and thoroughly revised in 1870; in 1903 new statutes went into force. In the period between 1788 and 1902 twenty-three judges, or presidents, conducted the affairs of the community. Toward the end of the War of Liberation the Diet, the members of which had fled to Szegedin, emancipated the Jews (July 28, 1849); but this act had no practical results. The proposition of Provost Kremminger in 1861 to elect Jews to the municipal council shows the respect which the community enjoyed. 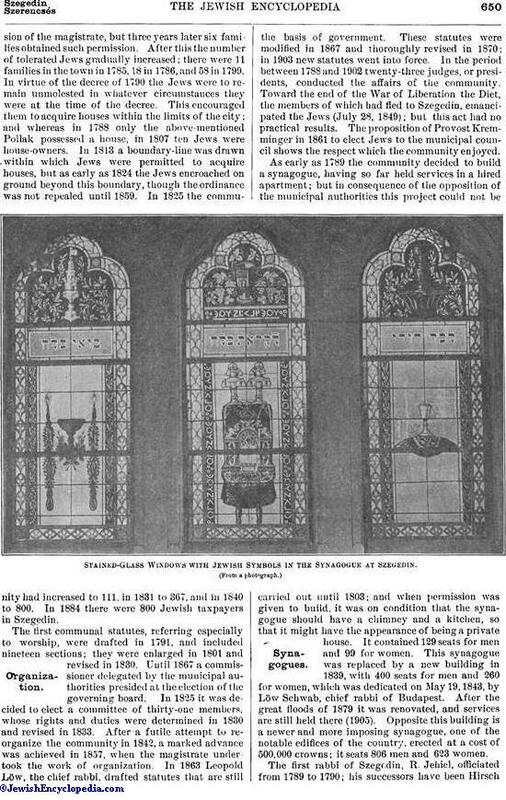 As early as 1789 the community decided to build a synagogue, having so far held services in a hired apartment; but in consequence of the opposition of the municipal authorities this project could not be carried out until 1803; and when permission was given to build, it was on condition that the synagogue should have a chimney and a kitchen, so that it might have the appearance of being a private house. It contained 129 seats for men and 99 for women. This synagogue was replaced by a new building in 1839, with 400 seats for men and 260 for women, which was dedicated on May 19, 1843, by Löw Schwab, chief rabbi of Budapest. After the great floods of 1879 it was renovated, and services are still held there (1905). Opposite this building is a newer and more imposing synagogue, one of the notable edifices of the country, erected at a cost of 500,000 crowns; it seats 806 men and 623 women. 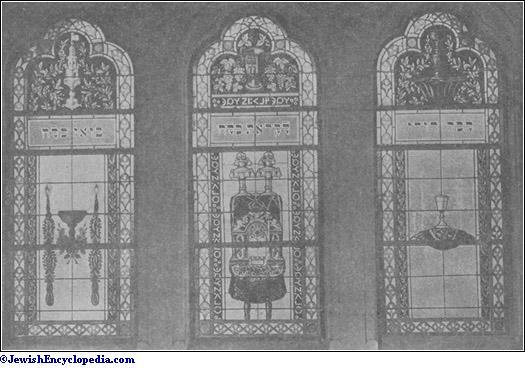 Stained-Glass Windows with Jewish Symbols in the Synagogue at Szegedin. The first rabbi of Szegedin, R. Jehiel, officiated from 1789 to 1790; his successors have been HirschBak (1790-1843), Daniel Pillitz (1843-47), Leopold Löw (1850-75), Wilhelm Bacher (1876-77), and the present incumbent, Immanuel Löw (since 1878). In 1831 a dayyan was appointed as assistant to the chief rabbi, and in 1894 an associate rabbi also was engaged. The community has had a notary since 1824. The Szegedin Ḥebra Ḳaddisha was founded in 1787; about the same time the Jewish hospital was established, in a rented building; but in 1856 the community erected a hospital-building of its own. The first cemetery was laid out in 1793; it was enlarged in 1810; but in time it was surrounded by houses, in consequence of the rapid growth of the city, and the bodies had to be exhumed (1867) and reburied in a common grave in the new cemetery. The Ḥebra Ḳaddisha had 490 members in 1903, and a fund of 120,000 crowns. The Biḳḳur Ḥolim was founded in 1821, and reorganized in 1861 under the name "Rofe Ḥolim." In 1831 a society for the relief of the poor was founded under the name Ḥebrat Orḥe 'Aniyyim, and in 1837 a similar society, the Ḥebrat 'Aniyye 'Irenu, which still exists. The Women's Society, which was the first one of its kind in Hungary, was founded in 1835 by Johanna Kohen. Chief Rabbi Löw founded in 1860 the society Ḥebra de-Sandiḳuth. A society for dowering poor girls was founded in 1865. Since 1892 the Orphan Society has had its own building, equipped with all modern improvements. The Young Women's Society conducts a kitchen during the winter for the benefit of poor children. 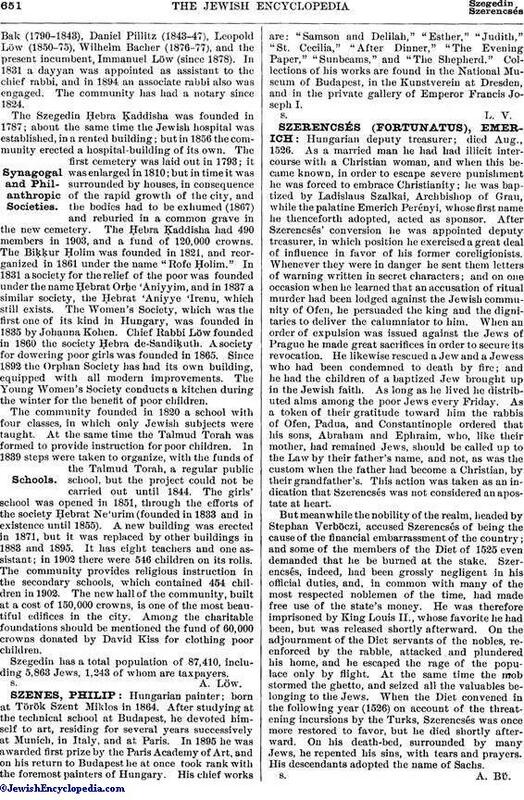 The community founded in 1820 a school with four classes, in which only Jewish subjects were taught. At the same time the Talmud Torah was formed to provide instruction for poor children. In 1839 steps were taken to organize, with the funds of the Talmud Torah, a regular public school, but the project could not be carried out until 1844. The girls' school was opened in 1851, through the efforts of the society Ḥebrat Ne'urim (founded in 1833 and in existence until 1855). A new building was erected in 1871, but it was replaced by other buildings in 1883 and 1895. It has eight teachers and one assistant; in 1902 there were 546 children on its rolls. The community provides religious instruction in the secondary schools, which contained 454 children in 1902. The new hall of the community, built at a cost of 150,000 crowns, is one of the most beautiful edifices in the city. Among the charitable foundations should be mentioned the fund of 60,000 crowns donated by David Kiss for clothing poor children. Szegedin has a total population of 87,410, including 5,863 Jews, 1,243 of whom are taxpayers.